If you love gardening, you'll love our range of FISKARS Outdoor & Gardening Tools. Whether you are weeding, chopping, sweeping or pruning, FISKARS offer a brilliant choice of lifestyle hand tools to make these jobs easier and your garden work for you; year in and year out. Drawing on the same spirit of innovation that initially started the brand, FISKARS have long evolved from the revolutionary Orange-Handled scissors to a broader offering of professional home and gardening solutions. 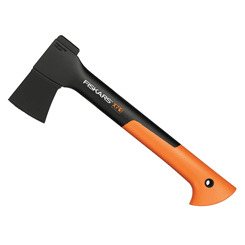 Always striving to find a better way to help the end-user, Fiskars are now on their 4th generation of X-series axes, designed to provide even more power with less effort. Topping this, the Fiskars ‘QuikFit’’ range of garden products have been labelled as a “gardener’s dream.” With interchangeable heads and handles they allow you to perform multiple tasks with fewer tools, just with a simple ‘Click’ action. We stock a comprehensive selection of FISKARS seasonal tools, available to purchase all year around. For when our British Summer lets us down and when we need to be prepared for the months ahead. It’s time to let FISKARS tools do the back-bending chores, so you don’t have to.